Kelly Austin is an Assistant Professor of Sociology at Lehigh. 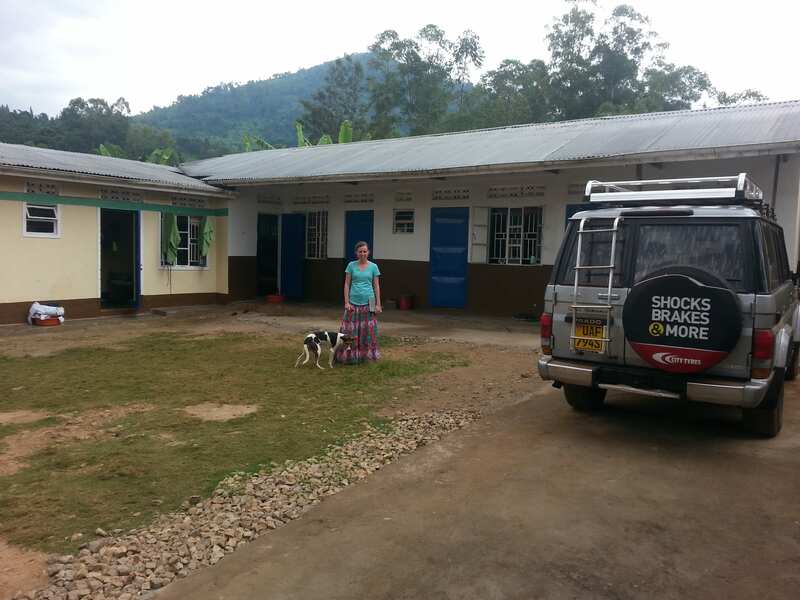 She is in Bududa, Uganda this summer with a group of students pursuing her research in community health. You can see her previous posts here. I’ve been winding down working on my own research here and I am focusing on enjoying my last few days in Bududa. The rain has also continued, making getting around an adventure. Today was the Lehigh interns’ last day working at the school, PDI Education Center. The Lehigh interns did an amazing job over the last two months. They were quite hard-working and self-sufficient, which made my job easier and allowed me to get more research done. One of the Lehigh interns is studying business. He did great work drafting a formal report on the current status and challenges with the school, the chief one of which had to do with over-hauling the school budget. 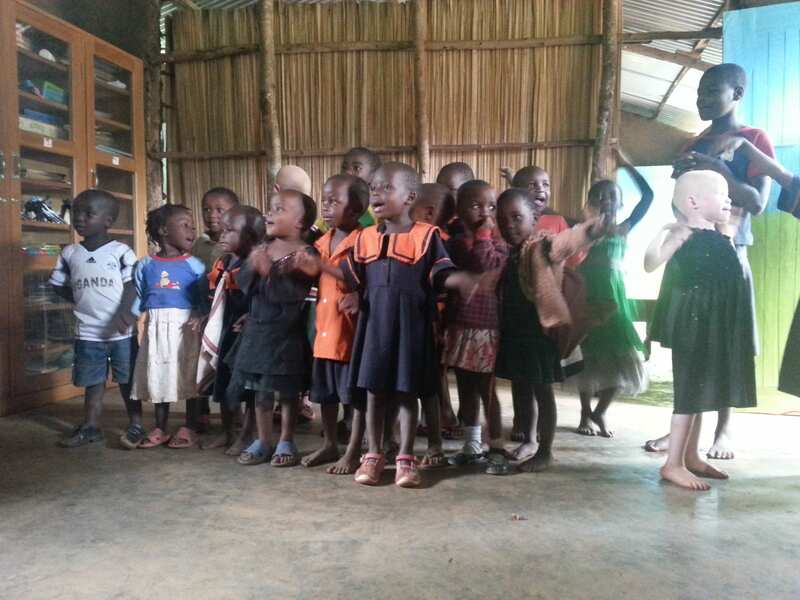 The Lehigh student visited about a half dozen other primary schools in Bududa for comparison, and was able to develop relevant recommendations for PDI Education Center concerning staffing, staff payment structures, changes to the school fees, etc. The PDI board of directors already approved his recommendations, so I am sure that his work will have a lasting impact on the school for years to come. Early in the summer, the Lehigh interns noted that there was a dearth of learning materials on the walls of the classrooms, as well as an absence of the young pupils’ work and art. I was so happy when we visited the school this morning and I saw all of the materials they created with the young pupils featured on every wall. Another highlight was the goodbye and thank you ceremony that the children put on for us. They sang of series of several songs, danced, and gave short speeches. A few of the songs were created just for us, as they had special messages in them. For example, one group of children sang lyrics that said, “We are so sorry you are leaving, will you write a letter to us?” Other songs included messages of “thank you” and they would insert our names in each chorus. After the performance, we played outside with the children. We blew bubbles, which were a huge hit!!! We also rewarded the children with some “sweets” or candies – a very rare treat for many of these children. We’ve had several days without power. The prolonged lapses in electricity are most commonly due to “load sharing.” Uganda does not produce enough power to sustain all of the districts or regions at once. So they literally “turn off” entire districts for days at a time to share the load with other areas. I asked Dezz how long they usually turn off the power in Bududa for load sharing. He responded, “It can depend…on if someone in Kampala forgets about you or not.” Other “blackouts” might only last 1-2 days or several hours. These are mostly due to people tapping into the lines illegally, which is widely common here. Walking up and down the paths of the trading centers, you can see shops and dwellings securing to the electricity wire with a bent nail or piece of scrap metal. All of the recent power surges have cost us 3 surge protectors, as well as my computer charger, which is totally fried. Luckily, Mark & I use the same type of charger, but now we are sharing one charging block between us, which makes working on the computer even more of a challenge. So, the word is out. The Lehigh “mzungus” are back in Bududa and thus people are showing up again at the Zaale compound. This all started about 2 summers ago, as I began actively researching health issues in the area. Many locals incorrectly conflate my understanding of public health with being a trained doctor or medical practitioner. What they do understand is that we are willing to do what is needed to help obviously sick people get the life-saving interventions they need. Every time another “patient” rolls in, I explain to them that I am not a doctor, but that I would be happy to transport them to the private clinic (and pay for their treatments). So far this year, the students and I have helped over a dozen people (mostly children) get to the private clinic on the other side of the district. 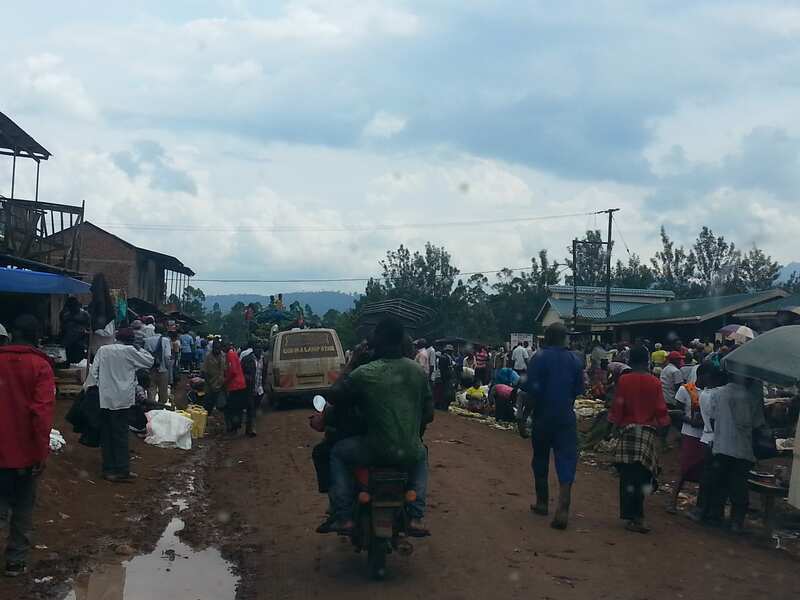 There are no clinics in our village of Bubiita, and the nearest clinic is run by the government and faces “stock outs” of medicines for 3 weeks out of every month. So most don’t waste their time walking 2 miles to a public clinic without medicines and instead seek out our assistance, when they can, to get them to the private clinic. Our peak day was about 2 weeks ago, when I drove 6 children to the clinic who just showed up at the gate, with fevers, vomiting, and other active aliments. 4 of these 6 children had malaria (and only 2 of them threw up in the car – yay!). One of them had severe malaria (+++) which would have quickly progressed into cerebral malaria without immediate action. He had to be on IV treatments, but has made a full recovery. I am grateful to have a number of Lehigh students on the team this year that are pre-med or interested in public health. They have been helping me take patients to the clinic when I am busy working on research, as well as following up with their treatments. When children arrive, we take them to the clinic and help them through all the stations (check in, vitals, consultation, lab, etc. ), especially the young ones that would be lost without someone to guide them. This is often a feat in itself, as some of them are so young or under-educated that they do not even know their age or last name. For the kids that come from unstable homes, we have them return to the compound whenever they need their next dose of medicine and give them a meal and clean water to take it with. For some of the children, like the very young ones, we find out where they live from Maayi or Papa, then do “house calls” to follow up with their medications or treatments at the proper time. Many children or adults are just simply too poor to pay for the private clinic, so after getting them there and back, we send them on their way, making sure they know how and when to take their medication and stress to them the importance of adhering to the full dose. I know that this anything but a long term solution for the community. I often think about what happens to these sick children when we are not here for the other 10 months of the year. I know that many of them would end up in really bad shape, likely going to the apocalyptic Bududa hospital where you “walk in with one disease but come out with five more” (quote from a local health inspector) as a last resort once their illness had progressed to devastating stages. Or many of them would treat themselves from a drug shop or local healer, likely not getting an accurate diagnosis (if any) or the proper dosage of treatments. So in the meantime, we take them to the clinic. I don’t have the heart to turn away sick people when they arrive on our door step. One of the key research projects I am working on here is looking at the hidden costs of coffee cultivation in Bududa. 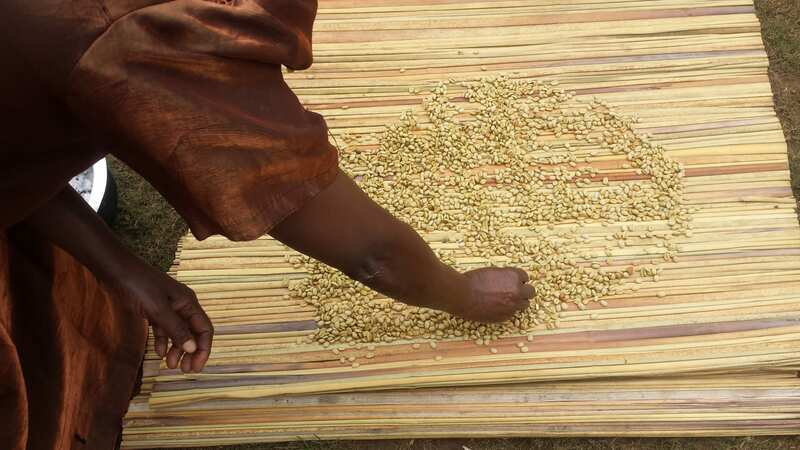 In this remote region, coffee is the only product that links Bududa to the international market. So far, I’ve interviewed over 20 coffee farmers, traders, and community leaders. For all but 2 of the interviews, I used Dezz’s assistance to translate and help co-conduct the interview. 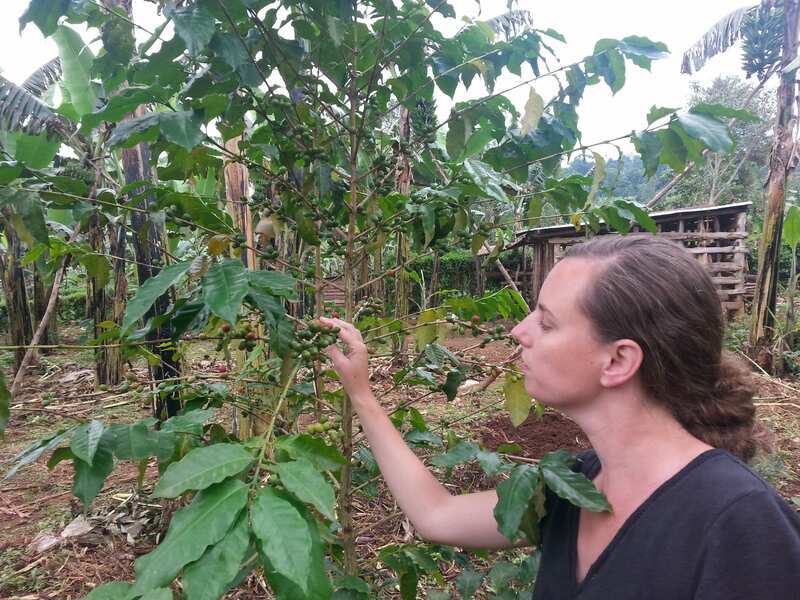 Sometimes, we walk out into the community and meet the farmers at their coffee garden. They are always very proud to show me their plants. Other times, Dezz organizes the interviews so that the participants come to the Zaale house to be interviewed. This has been the case with all the women I have interviewed, because if I had met them on their property, their husbands would have overseen the interview and I suspect I would have not gotten honest answers. Malaria Outbreak Strikes the Compound! Kelly Austin is an Assistant Professor of Sociology at Lehigh. 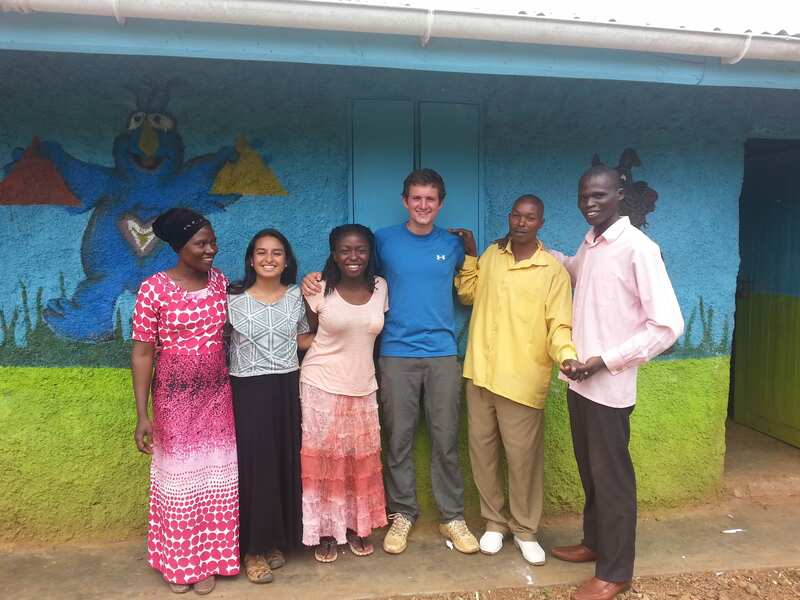 She is in Bududa, Uganda this summer with a group of students pursuing her research in community health. You can read her previous post here. Overall, things have been going well the past few days. Power has returned! Yay! Hopefully it will last several days without interruption. 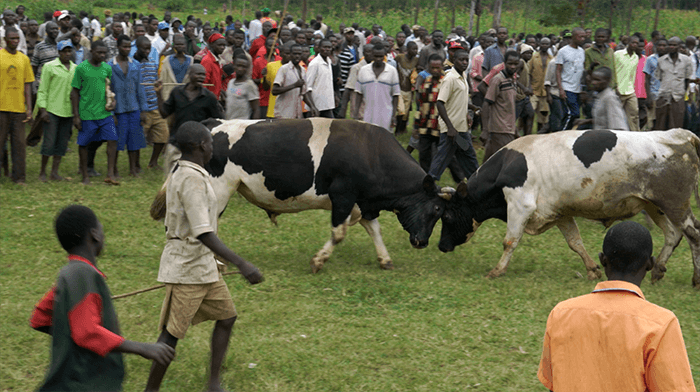 On Saturday morning, Mark & I took the students to go see one of the favorite weekend activities in Bududa – bullfighting ! Bullfighting is not like we think of it in the US, with a red-clothed matador beckoning a bull, but rather, large bulls fighting each other until one of them runs off, concedes, or is badly injured. It is essentially chaos, with hundreds of people (mostly men and children) on a large pitch (soccer field) running around, yelling, following whichever bulls are in action. The crowd scatters for their lives whenever a bull gets tired of fighting or concedes a contest, taking out whoever is in his way. Luckily, we saw no human injuries, and Peter and Dezz Zaale kept our Mzungu group safe at the top of an embankment behind some very thorny bushes. At one point, the bullfighting settled a bit, so they brought out a female bull to rile the fighting male bulls up. Boy did that work! The tone changed that afternoon when several of the Zaale grandchildren and members of our Lehigh team started to fall ill with fever and vomiting. I spent most of Saturday afternoon dolling out ibuprofen and Cipro (medication for bacterial infection), taking temperatures, and making my students ramen noodles. In total, 3 of 6 the Lehigh students were ill. They all started to improve slightly on Sunday, but 2 of them continued to have fevers at night. This is a common sign of malaria. 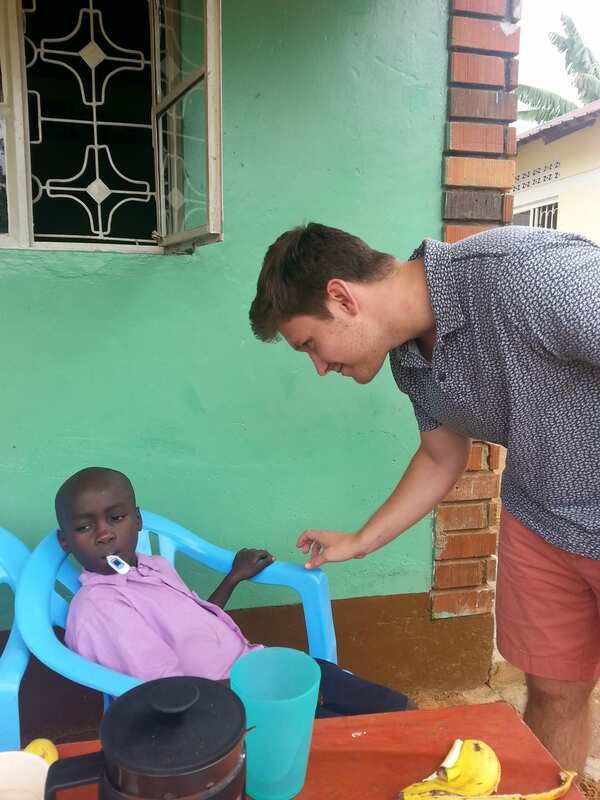 I contacted my good friend, Dr. James Wafula, and he agreed that I should take all of those with fever to his clinic (which is one the other side of the Bududa loop) on Monday morning for malaria testing. Kelly Austin is an Assistant Professor of Sociology at Lehigh. 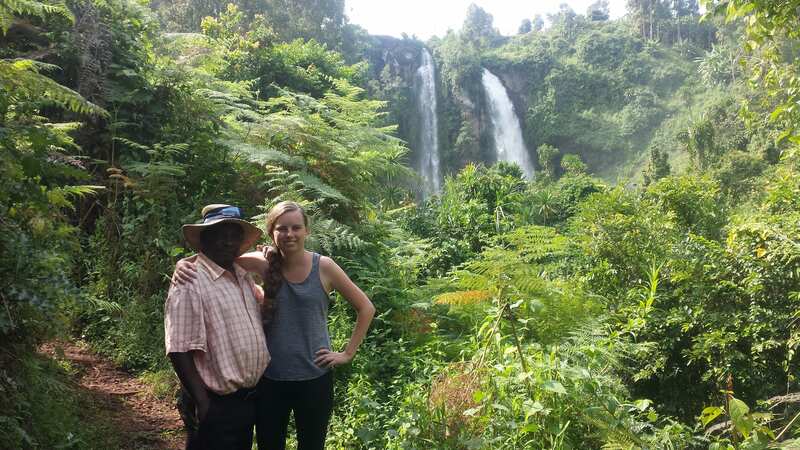 She is in Bududa, Uganda this summer with a group of students pursuing her research in community health. You can read her first post here. So let’s talk infrastructure. We stay with a local family, the Zaales. David Zaale is around 70 years old and has lived in Bududa his entire life (except for when he was forced to temporality relocate to Kenya for several months during the Amin era). David and Elizabeth Zaale have several children, the eldest is in her 40s, and the youngest, Dezz Zaale is in his 20s. The Zaale compound is extremely nice and well-developed compared to the other homes in Bududa, which tend to be made of mud and dung (both inside and out). While we benefit from having brick walls, cement floors, and some paved “sidewalks” that connect the guest rooms, other conditions are a bit more rugged. There is no running water, and the electricity is very spotty. We use pit latrines and take “bucket baths”, where we use water that is harvested from the river to douse ourselves clean (or clean-ish). As I wrote in the last post, the roads are very bad here, you are either fighting dust or mud, and it takes about 1 hour to go ~12 miles. We most often walk to where we need to be. We are lucky enough to have 3 house ladies (or silent soldiers, as I like to call them) who work all day long, fetching us water, cleaning the rooms and latrines, cooking our food, washing our clothes in the river, washing dishes, etc. Of course, many members of the Zaale family chip in on these tasks, including Elizabeth herself. As I often notice here, the women work so hard all day long. Tirelessly hand plowing in the gardens, collecting fire wood, picking stones from uncooked rice, and tending their children. Since we arrived in Bududa, we have had electricity about half of the time. We are in a bad stretch right now, having been without electricity for about 4 days. Of course, this makes working and doing research a bit challenging. Fortunately, Papa David Zaale has a generator (one of the only ones in the village) that he turns on for us for about 3-4 hours per evening so we can charge our computers, audio recorders, and phones. However, if we all plug in at once, it overloads the generator. So, it is a bit of a shuffle and negotiation of whose devices get priority in charging, based on what tasks each of us need to do the following day. Another challenge to work here can be the noise. With so many people around the compound, including extended family members, young grandchildren, and infants of the house ladies’, the level of crying, playing, singing, and talking can be a bit intense sometimes. And Ugandans love music. 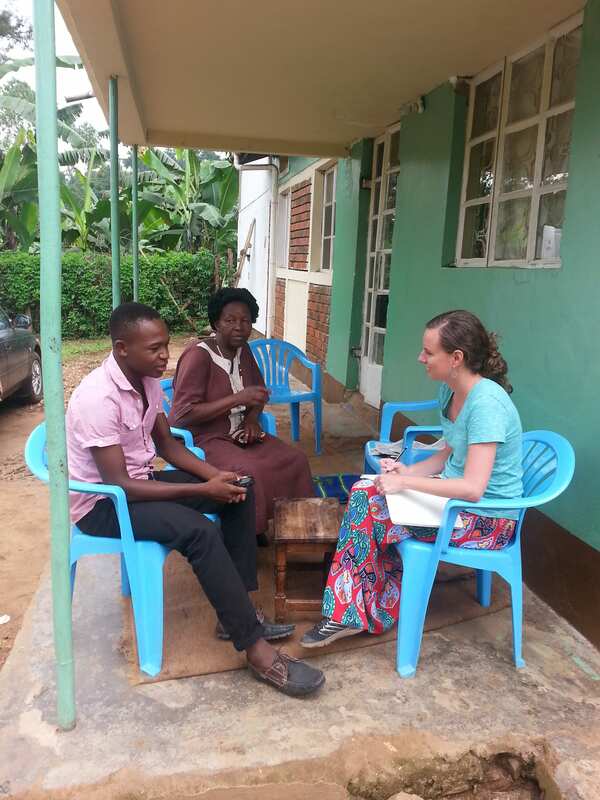 The students and I sometimes sneak into the garden to find a quiet spot to do our interviews (when they are not at a health center or a community members’ house), and we’re trying to institute a couple of “quiet” hours from 3-5 in the afternoons to do the transcribing. Transcribing involves typing out word for word everything that was said in the interview from the audio recording. Transcribing typically takes about 3-4 times longer than the actual interview itself. While this task is arduous and time consuming, it is an absolutely necessary step of the qualitative research process. Dezz Zaale is one of our key translators and community liaisons. Papa Zaale has amazing connections to many administrators and health workers in the district, as he was an educator in Bududa for over 50 years and Elizabeth has served in local political positions. Each year, Papa uses his connections to help us expedite the process of getting clearance from the District Health Officer to do research in the health facilities. Though, this still usually takes hours of sitting and waiting for an appointment or chance to talk to the DHO and get her rubber stamp of approval. Dezz does the hard work on the ground of securing community members, interview times and locations for us, as well as helping us to refine our interview guides before each interview to ask questions in culturally appropriate ways or ways that will make sense to the local population. 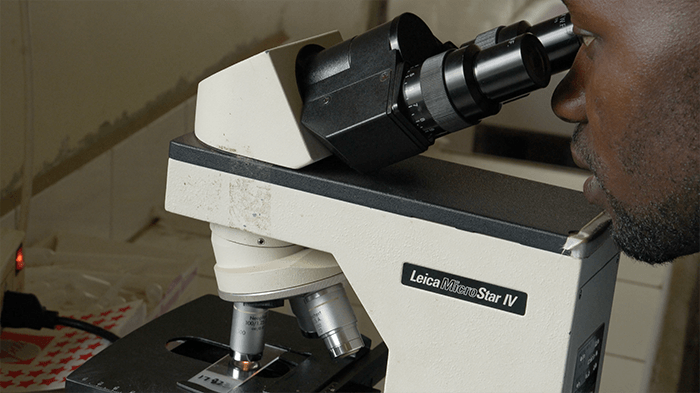 Without the help and support of the Zaale family, my research would not be possible. I am deeply appreciative of all they have done to support my work and provide meaningful experiences for the students. My name is Kelly Austin. I am an assistant professor of sociology and I direct the Health, Medicine, and Society program. 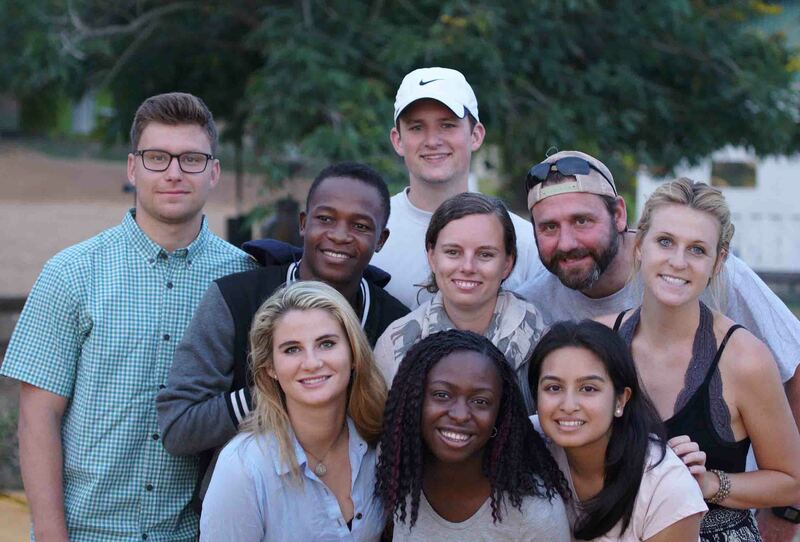 This is my 4th summer trip doing research and leading student teams in the rural district of Bududa, Uganda. I was asked to write this blog to get an insider’s view of what it is like to do research and work with students in such challenging, yet rewarding, conditions. On Saturday we set off for safari. We enjoy doing this excursion with the students at the beginning of the trip as a bonding experience. We hiked Murchison Falls, and were lucky enough to see lions, a leopard, elephants, lots of variety of monkeys, giraffes, hippos, crocodiles, and more birds, butterflies, and antelope than you can imagine. 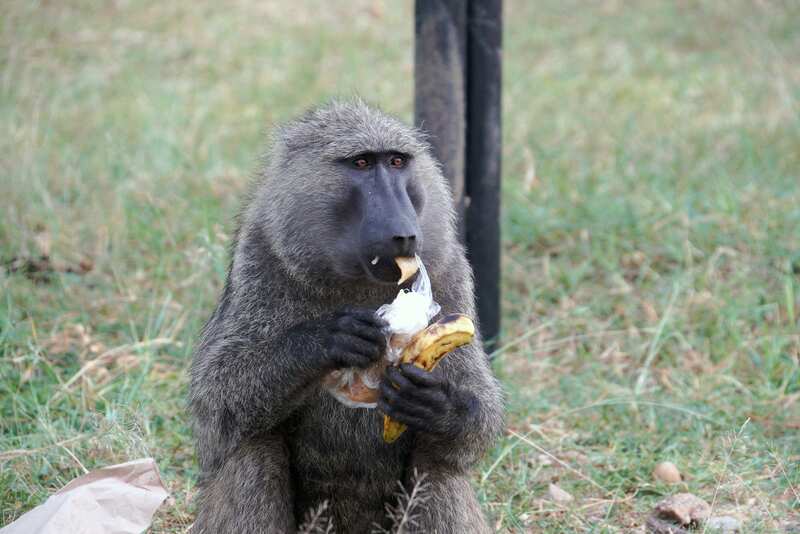 On our last day of safari, our luck changed. One of my students became very ill. In sociology, we use the term “status set” to describe the different positions we assume in our social lives. On trips like these, I am a program leader, a researcher, a mentor or adviser, a friend, a community advocate, and oftentimes, a mom or nurse. I did everything I could to make my student comfortable and used my medical knowledge to treat what appeared to be a bacterial infection. These are common for students (and myself) to get here as our bodies are exposed to bacteria that we are not used to growing up in the U.S.
We arrived last night in the village of Bubiita, Bududa. The welcome was amazing. The entire Zaale family (who we stay with) as well as over 30 village members were there to greet us, yelling greetings, hugging, and bouncing with joy. The crowd included some young boys I helped to get medical treatment last summer. 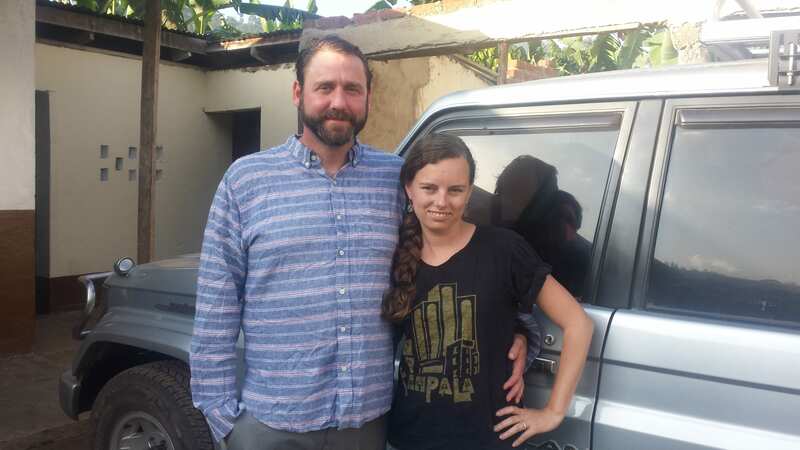 Unfortunately, my student’s condition did not improve much over the 3-day course of Cipro, so we are putting the car to good use and taking the student to a hospital in the nearest town, Mbale (one hour away, on an extremely bumpy road). As I sketch out this post, I am sitting in the waiting room of Mt Elgon Hospital waiting for test results. We have been here for about 2 hours, and had to stand in many lines and go back to the cashier between each phase of the process to pay for the next step (e.g. consultation, lab, diagnosis, consultation again, pharmaceuticals). The entire cost was about 100,000 UGX (Ugandan shillings) or about $30. After the process, the student asked what happens to the extremely poor households he sees in the village that would never be able to afford private care. I explained that they would seek care at a government clinic, but these frequently have stock-outs (2-3 weeks per month) where no medications are available. They would be forced to pay out of pocket for the medicines at a local drug shop, which maybe they could or could not afford. My student is handling the horrible illness with a brave face. I tell the student jokes and funny stories as they take his blood and we sit on uncomfortable metal chairs. I’m calling the student “Trooper” as a nickname now for being such an amazingly great sport about everything. There are local Ugandans all around us; sick children, limping elders, people in pain. We are the only “mzungus” (foreigners) at the clinic. The results are in and it is indeed a bacterial infection. He’s prescribed a stronger antibiotic and we are on our way.